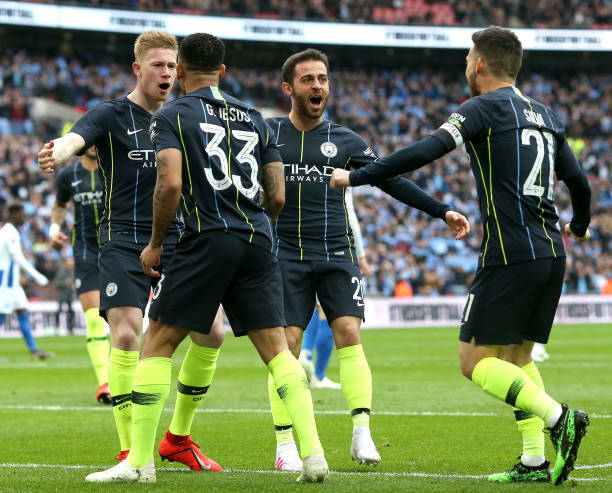 Gabriel Jesus' early header proved the difference as quadruple-chasing Manchester City claimed a place in the FA Cup final with a 1-0 win over Brighton. Controversy erupted when City's Kyle Walker escaped a red card after a VAR review of a coming together with Alireza Jahanbakhsh but, despite resisting further damage, Brighton could not find a way back. Chris Hughton's men applied plenty of pressure in the second half, with Aymeric Laporte producing a fine clearance to deny Glenn Murray but City managed the game well. City made a confident start, and while Brighton may have been pleased to see that Sergio Aguero had failed to shake off a knock, they were soon left reeling by his deputy. Just four minutes of mostly City-controlled play had elapsed when De Bruyne bent a delicious cross behind the Seagulls defence that sat up invitingly for Jesus to meet with a powerful diving header. Brighton's fans, who outnumbered those from City and were clearly savouring the occasion, were immediately silenced. The team were similarly deflated and it took some time for them to recover. Yet City did not go in immediate search of the killer blow. With another big date in the Champions League at Tottenham on Tuesday they seemed content to play patiently and it did not make for a great spectacle. While Brighton had a half-chance through Anthony Knockaert and David Silva had a shot blocked, the main talking point of the first half came when Walker and Jahanbakhsh clashed. The pair chased a ball into the City area, with Walker reacting badly to being pushed in the back. After going head to head, Walker made the next move, appearing to push forcibly towards Jahanbakhsh. Referee Anthony Taylor booked the City player but there was a VAR check for a potential red card. Eventually, Walker was given the benefit of the doubt but bickering between the players continued for some time afterwards. It was perhaps with that in mind that City boss Pep Guardiola removed Walker at the interval, although the England full-back had also required treatment towards the end of the first half. With left-back Oleksandr Zinchenko out injured and Benjamin Mendy making his first start since November in his place - which had been a surprise - City perhaps showed potential vulnerabilities on the flanks. Yet Brighton could not expose them further despite a positive start to the second period. Pressure almost paid off when Shane Duffy headed into the danger area from a corner, while Murray looked a certain scorer as the ball dropped invitingly in front of goal, only for Laporte to intervene and hack over the bar. That prompted a response from City and Sterling brought a fine save out of Mathew Ryan with a curling effort from outside the box. The England star also had an effort blocked by Lewis Dunk before forcing another save from Ryan in the closing moments. 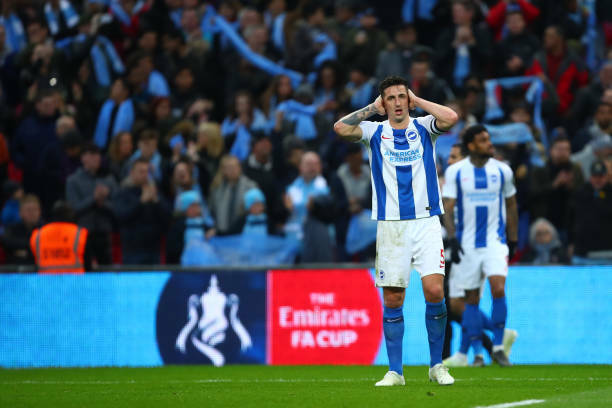 In Brighton's final flurry, Knockhaert appealed for a penalty after a clash with Laporte but nothing was given.